Tractus3D was founded in 2015 by Daniël van Mourik and Ben Schilperoort. 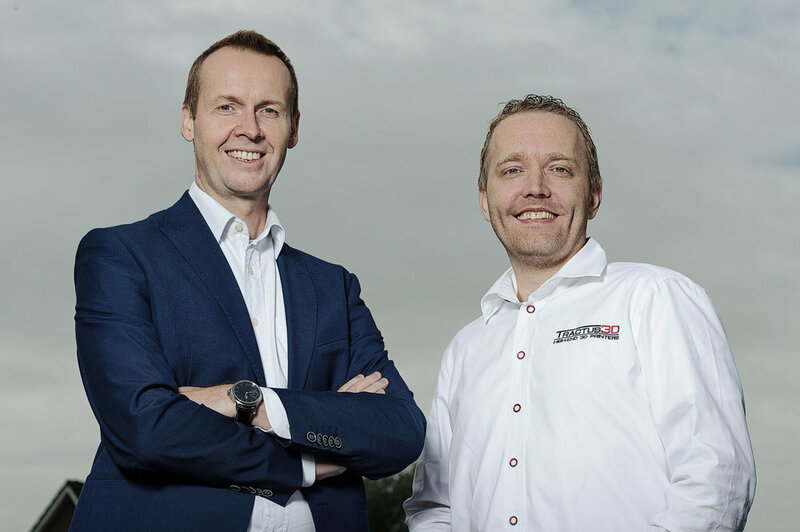 With Schilperoort’s successful business background and van Mourik’s technical expertise, they form an ideal team to conquer the 3D printing market. With a burning passion for innovation, Tractus3D works on developing the best 3D printers. 3D printers are gradually being used by more and more companies to develop products and prototypes. By doing this, they not only save a lot of time and money but they also have more design flexibility. In the coming years, 3D printing will play an even more prominent role in the production chain. It is therefore not a surprise that the 3D printing industry has grown into a very competitive market in a short amount of time. Tractus3D differentiates itself from its competitors by offering a good price/quality ratio and a unique assortment. For instance, they offer printers with an enormous print volume of up to 210 centimeters in height. Tractus3D also has a printer in its assortment that can handle extreme temperatures, which makes it possible to print with extraordinary materials such as PEEK and PEI. These materials see their applications in the medical and automotive industries, to name just a few. Another unique feature is that the printers of Tractus3D are built modularly. Because of this, they are able to offer a service level agreement with their products so customers can always upgrade to the latest version. With a technology that is developing fast, this is a big advantage as their customers are always assured of the newest system. In the short amount of time that Tractus3D has been active in the 3D printing market, they have already secured some influential customers. With its large volume printers, companies such as mannequin manufacturer Hans Boodt can now easily create new concept models, which they can then later start mass producing. With their unique assortment of products and the high temperature printer in particular, Tractus3D is more than ready to take over the industrial 3D printing market. They strive to be a leader in the delivery of innovative 3D printing solutions in combination with exceptional customer service.